This article is about minifigure of a similar name. 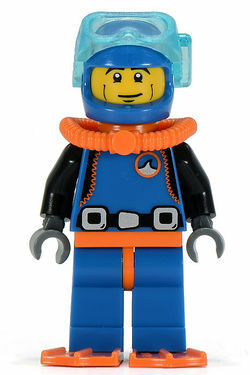 For the Series 8 minifigure, see Diver. The Deep Sea Diver is a minifigure that was introduced in 2010 as a part of 8683 Minifigures Series 1. The deep sea diver wears a blue helmet with transparent light blue goggles that are equipped with a snorkel. His face has black eyes with white pupils, and has a slight smile. On his back, the diver has an air tank which comes in a bright orange. His torso is blue with a black belt with a grey buckle and squares. On his chest and to the side is also a symbol depicting a grey wave against a blue background. His sleeves are black, a design which begins on the torso and is connected to the blue by orange stitching. His hands are grey, legs blue, and hips and flippers are orange. A diver is a person which explores under the surface of bodies of water for either sport or as a job. However, the Deep Sea Diver also swims in bathtubs and fish tanks in his search for finding unique fish. He also believes that he is unable to breathe on land, and wears his wetsuit around all the time. In the LEGO Club Magazine, the Spaceman and the Deep Sea Diver are seen fighting for the attention of the Cheerleader. In the online animations, The Deep Sea Diver is seen waiting for someone to send him into the dunk tank. Several minifigures from First Series, including the Nurse, Forestman, Cowboy, are in line to hit the target, but no one can. Finally, the Diver gets bored and throws one of his flippers at the target and falls into the tank, swimming contentedly. He and the Surfer Girl have the same logo on their wetsuits. The Deep Sea Diver's face is available on the Extended mode of LEGO Digital Designer. The bright orange air tank is exclusive to this minifigure. The Deep Sea Diver's official CGI images depict him with a face different from his physical variant. The Deep Sea Diver seems like a nice enough fellow, but no one can tell for sure, because no one can understand what he’s saying. Whenever he speaks, all that comes out is burbles and bubbles. He might be easier to understand if he ever took off his diving mask and air tank, but he thinks that he can’t breathe without them and always keeps them on, even when he’s walking around on land – which is a pretty funny sight, thanks to those big flippers on his feet! The Deep Sea Diver loves the water and can often be found swimming around in fish tanks and bathtubs, hoping to spot rare and exotic fish. He loves to tell stories about his amazing undersea adventures, but of course it’s impossible to guess what he’s actually talking about. His gestures and sound effects certainly make it all sound very exciting, though! The Deep Sea Diver once traveled twenty-ONE thousand leagues under the sea. The Deep Sea Diver spent a week in Atlantis, but nobody back home could understand him when he tried to tell them about it. The Deep Sea Diver has personally discovered over thirty new species of sea life, including the Chocolate-Chip Cookie Shark and the Inflatable Squid. Facts about "Deep Sea Diver"
This page was last edited on 27 August 2016, at 23:03.